The Leo Triplet (also known as the M66 Group) is a small group of galaxies about 35 million light-years away in the constellation Leo. This galaxy group consists of the spiral galaxies M65, the M66, and the NGC 3628. 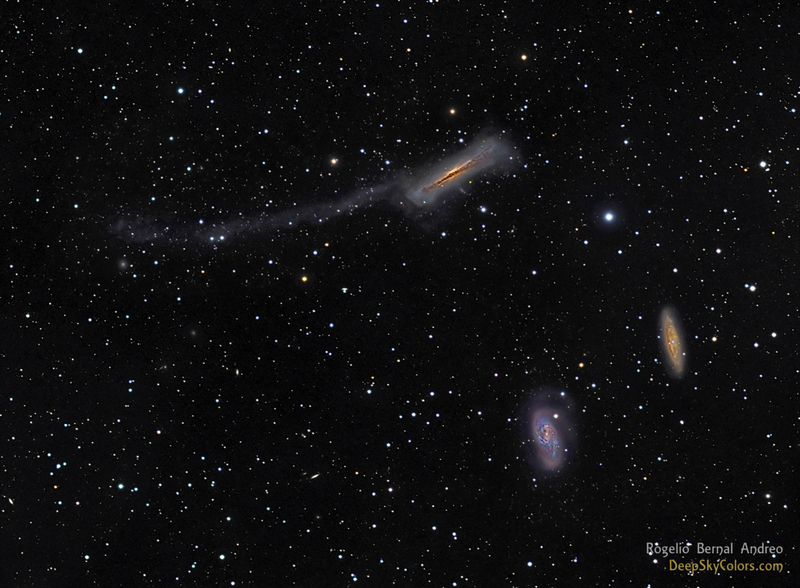 Tidal and gravitational forces are acting between these galaxies, but even more interesting -at least to me- is the 300,000 light-years long tidal tail from NGC 3628. You don't see often this tail in photographs. It is just so dim! As such, this image has been processed to show the tidal tail, but if the amount of light we see in this image coming from the tail as at that intensity, the light coming from the galaxies would be so strong that we wouldn't be able to see any details in the galaxies. wasn't bad but not as good andI decided to go for 12 minutes that night.